Dianna, Heather, Glenda and I took an introductory glass art class last weekend. 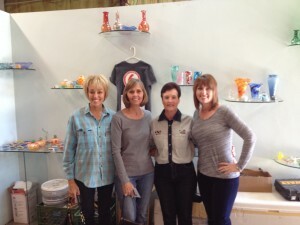 Dianna had a coupon and asked us if we would be interested in going. 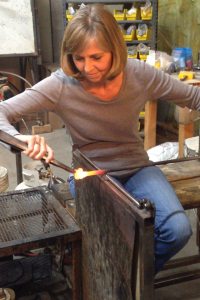 My first response was , “No way!”, but before I could reply, Heather gave an enthusiastic “YES”. So I decided to see if Glenda would like to go, and she was also very enthusiastic. Then I got enthusiastic, too. Carrie and Gisele were also invited, but declined. The two guys who taught the class stressed that this was merely an introduction and more extensive class are available, and required, to develop any skill. 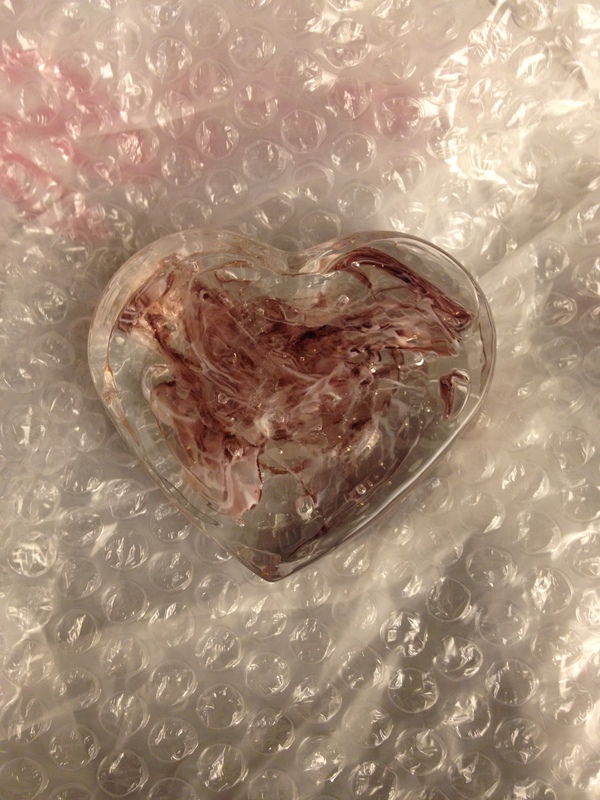 We all had the chance to make a project, in this case a molded glass heart. Later, we could do a second project for a small additional cost, which we all decided to do. 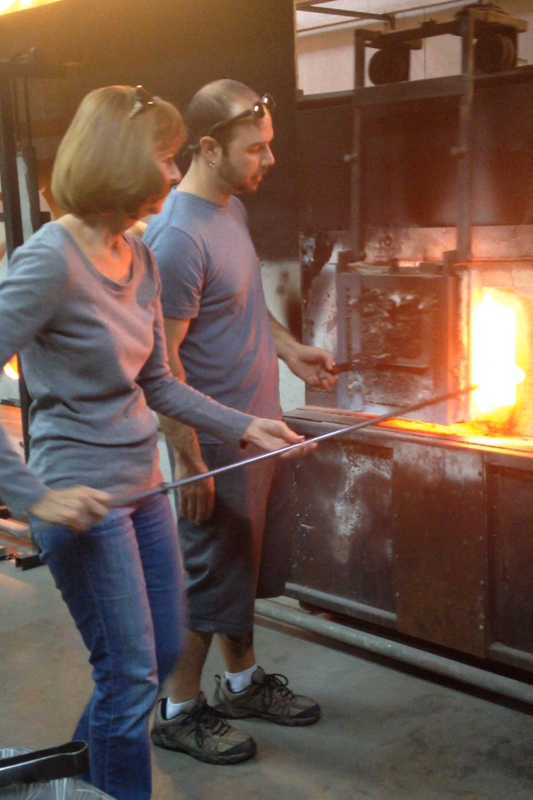 As we quickly found out, the instructors really do about 90% of the work for us, allowing us to put our hands on the steel tubes and tools with them, but not get anywhere close to the molten glass. (NOT that there’s anything wrong with that!) 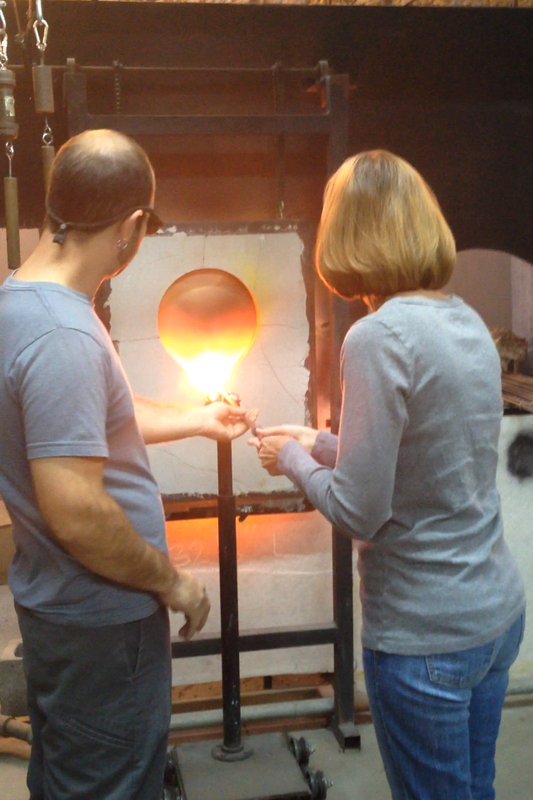 We picked our colors, and they dipped up a glob of liquid glass out of the 1700° cauldron. 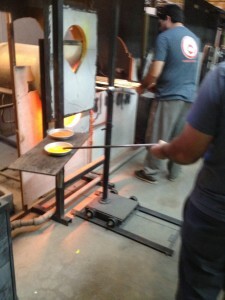 We helped slowly spin the pipe to keep it from dropping off, and then dipped it in the colored glass bits and back into the “Glory Hole” furnace to melt them together. 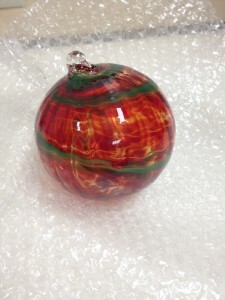 Then we quickly sat down as the instructor brought our blob on the end of the pipe, and with a giant “tweezer”, we twisted and swirled the colors together along with the clear glass. 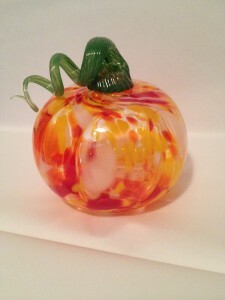 That only took about 30 seconds before the glass firmed up too much to manipulate. 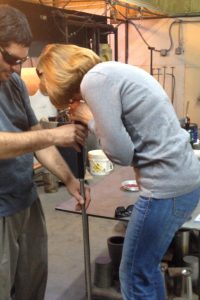 Then (again) the instructor carried it to a table and dropped it into the heart form mold. We pushed it flat with a plunger, and then used a blow torch to smooth the nub where the glass had been cut off the pipe. 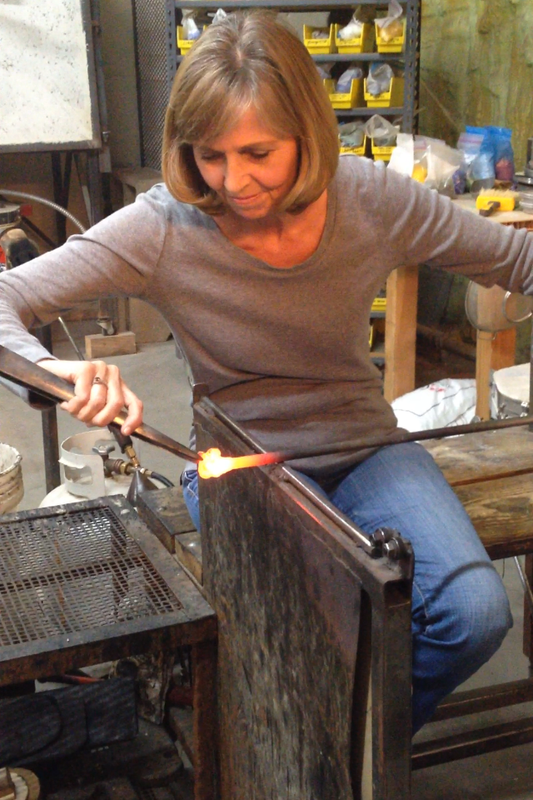 The next step was important to prevent the glass from cooling too quickly in the room temperature air and shattering. 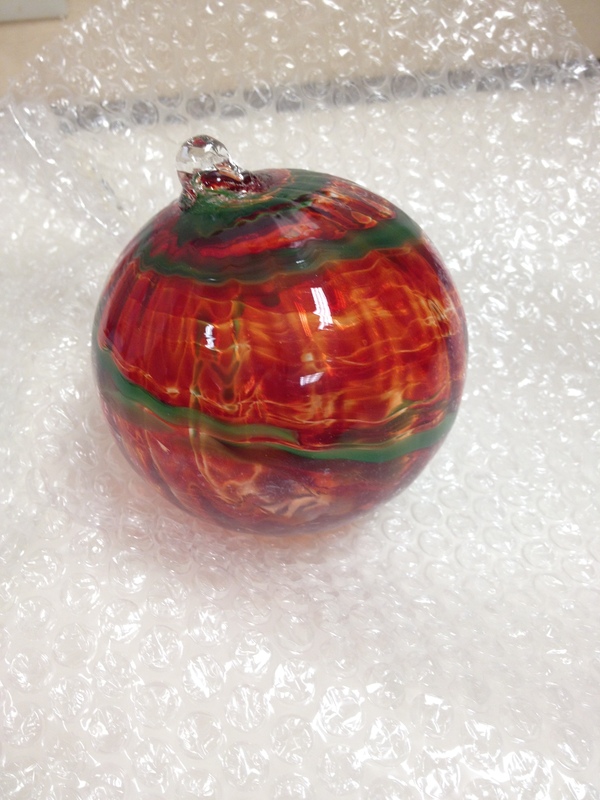 They carried it to a warm kiln where it had to be brought down to room temperature over an 8 hour period. After the class, we all went out for lunch and ice cream and sat outside on the patio chatting for about three hours, just having a great girls day out and gab fest. We could not take our projects home that day since they had to cool in the kiln, but luckily for us, Glenda had a pottery class about a mile from the studio the next day, and she stopped by afterwards to pick up all of our art work for us. 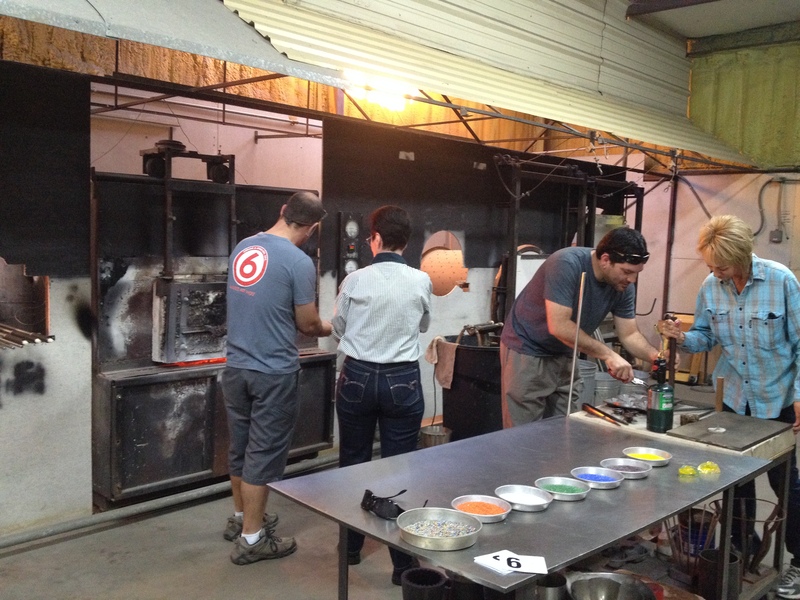 We are keeping our eye out for an encore day by taking a painting class in the next month or two. 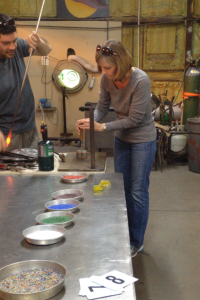 I’ve been assured you don’t have to be an artist to participate in these classes. 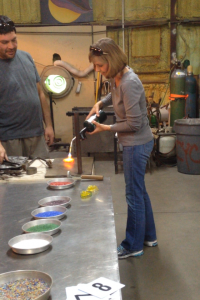 With plenty of wine or mimosas consumed, everyone can make a masterpiece! Here are a few video clips from the glass class. What a great run the Arizona Wildcats have had this season. They went undefeated their first 21 games, which is a school record. Last night, that run came to an end when the California Golden Bears beat the Wildcats with a three pointer just before time expired. The home crowd stormed the floor of Haas Pavillion with .9 seconds still left in the game. The referrees, coaches and announcers had to shoo everyone off the court before Cal received a technical foul, so the Wildcats could make their final attempt to tie the game. It was not to be, and they suffered the first loss of the season. A greater loss than the game score is the probability of Brandon Ashley’s broken foot taking him out for the remainder of the season. Sean Miller is already making his switch up plans, and the team will continue on, with Arlington, Texas and the Final Four in their sights. Next up: Oregon at home on Thursday. Let’s start a new winning run and not stop until we win the National Championship game on April 7th. Go ‘Cats! !